No, I haven’t done a full, double blind study BUT I have learned by my own experience, by my observations as a guitar teacher and the experiences of those around me that there is a connection between creativity and energy. There is often a connection between creativity and spirituality as well!! So, here is a list of 5 -10 minute ideas I keep handy that I try to intersperse in my day and help me find more joy, energy and progress!! I simply work a while then refresh a bit then continue the routine. Try it then please email me to let me know how it works for you! 2. Begin with a deep breath and stretch upward then choose one of the following activities that appeal to you. Even 5 minutes can make a big difference! – Relax, close your eyes and visualize something you hope for and want to see happen. See yourself in the future experiencing your hope/dream/goal. (I love hammocks so I drew a tiny hammock on a paper with other hopes/dream/goals then during my visualization time I saw myself swinging on a beige colored hammock. Recently I received a beige and maroon hammock for my birthday!! I wanted to write a book telling my story so I imagined myself holding it while sitting on a carrousel. This month I discovered a carrousel at a resort Dan and I was able to have pictures taken with me holding my book!) One caution I would add is to choose goals that don’t involve getting others to do what you want. I planned to earn my hammock, having it come as a gift was a big bonus! – Art: Draw color or sketch something…anything! – Pray: Ask God to help you know who you can serve, give a note to, write an email etc. I am pleased to announce that my little ones have arrived!! They are safe and sound. Although labor lasted over a year they are beautiful. All 120 of them!! After he finished praying, Dan and I embraced each other and wept. Although I couldn’t tell just how this hellish experience with depression could ever be a blessing, at least now I knew that it wasn’t just a lack of character, a fatal flaw or a terrible imperfection…. It was part of my life’s experience that God somehow meant to use to benefit myself and others. Please would you help us get this book into the hands and hearts of all those around us. Amazon lists their books in order of popularity so my book is down the list right now when you look up key words such as “depression and bipolar”. As more people buy it My Journey from Darkness to Light will rise closer to the top and offer hope to those who need it. 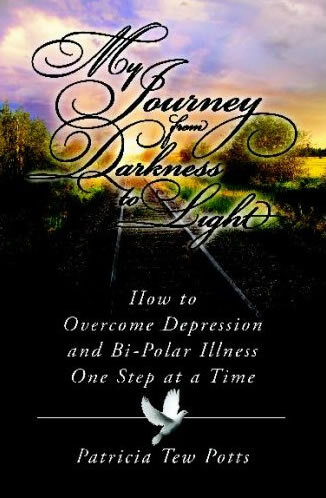 We are asking our friends and neighbors to order their books on October 7th so that we come out of the darkness (page 10) and into the light and help others to so as well!